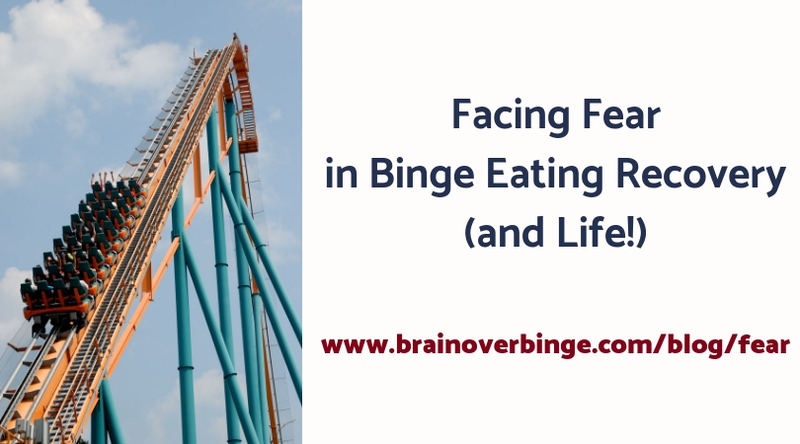 *Update 2019: I wanted to update this 2012 post because I’ve been thinking about how fear can sometimes discourage binge eaters from making the changes they desire. I also thought about this post (and my prior driving fear that I talked about here) during a 22-hour road trip that I just returned from. I was behind the wheel the entire way on the interstate, and not once did old fearful thoughts and sensations arise. The fear seems so distant now and makes me grateful for the plasticity of the brain. I hope this post encourages you to get out of your comfort zone in recovery or in other areas of your life. I want to share a personal experience I’ve had recently that relates to overcoming fear. This experience isn’t food related, but it has implications for eating disorder recovery. You may have fears around food or you may fear letting go of harmful eating habits, so I hope this post helps you see fear in a new way, and helps you start to overcome it. For about five years, I was afraid of driving on expressways (interstates/freeways…whatever you may call them). I rarely drove on expressways; and by rarely, I mean maybe twice a year. I had no problem riding with someone else driving, but every time I tried to drive myself, I experienced panic and anxious sensations. I found it easier on my nerves just to stick to slower roads. When I lived in Phoenix, AZ, this was not much of a problem, because it’s possible to get anywhere in the metro area without ever getting on an expressway, even though may take much longer. Our family moved to a new city about seven months ago, and that’s when I decided it was time to change. Both my mother-in-law and my mother don’t drive on expressways because of fear, and their current problems date back to when they were about my age. Maybe it’s a self-preservation instinct in a young mother to become more fearful; but whatever the cause, I didn’t want this fear to stick around and limit my travel options now and in the future. We are lucky enough to be living closer to my family now, and my goal was to be able to pack up and drive to visit them whenever I wanted – without my fear getting in the way. During the seven months since our move, I’ve overcome this fear about 90 percent. I take expressways nearly every day; I’ve driven eight hours to get to Tennessee, six hours to get to New Orleans and back twice; I’ve gone through Atlanta rush-hour interstate traffic a few times. I now feel I could conquer nearly any driving situation, and although I still get nervous passing big trucks, I still go too slow in the rain, and I still don’t like going over tall bridges, I feel so much more free. I know it was an irrational fear, even though there is certainly some real danger in driving. Most people drive on expressways without fear or with minimal fear, just as the majority of people eat without fear. For me, the fear response became temporarily linked in my brain to driving, and it’s possible that for you, the fear response has become linked to certain foods or ways of eating, or linked with your attempts to overcome your eating problems. I’ve been thinking about the way that I’m conquering my driving fear, and how it could help someone overcome fears in eating disorder recovery. In Brain over Binge, I explained how binge eating is usually ego-dystonic – meaning not in line with what you actually want when you are thinking rationally; and anorexia/restrictive dieting is often ego-syntonic – meaning it feels like it’s in line with what you actually want. When I was stuck in fear of the driving, my avoidance of the expressways felt ego-syntonic. I felt like it was fine to take the slower roads, and avoid my fear, because I truly believed my kids and I were safer by staying off of the expressways. Even though that may have been statistically true, my fear limited me very much and caused me to waste a lot of time I could have spent doing other things. But, I didn’t have much motivation to change, and became rather complacent, and just accepted it as the way things were for me. Each time I avoided an expressway, I cemented the pattern until it became a habit. It became something I simply didn’t do, and for years, I rarely even entertained the option. It was only when we moved, and visiting family required hours of interstate driving that I snapped out of my complacency and felt a desire to change. It was then that I realized that what started out as an ego-syntonic drive to avoid my fear had indeed become a habit, and it was now ego-dystonic based on my current goals. I realized that all the thoughts I told myself to avoid taking expressways were well-ingrained and had become automatic, just like my urges to binge had done in the past. Because of my experience ending the binge eating habit, I knew that the habitual thoughts and feelings discouraging me from driving on expressways were not going to stop just because I now wanted to drive on expressways. Just like with the urges to binge, I knew those thoughts and feelings would only go away if I stopped believing them and stopped acting on them. I didn’t bother trying to go back and figure out where the fear stemmed from or what else I could change in my life to help make that fear subside. I knew what would make the fear go away: simply driving on the expressway day after day. I had some doubts about whether it would work as well as it did with ending the binge eating habit, because I certainly don’t believe that the way I overcame binge eating is the solution to every problem (for more information on how I stopped acting on my binge urges, you can get my free eBook). The first few times I entered the on-ramp of an expressway, I felt extremely anxious. But, I knew that despite the feelings of fear welling up in me and the thoughts telling me to pull over, I could control my motor movements – I could check my mirrors, press the gas pedal, and merge left even if my hands were trembling a little. I just want to stop here and say that I realize some people with phobias experience a much more extreme panic reaction and may feel like they have no control of their motor movements, so I am not saying that everyone can simply face their fears head on without professional help, but I still believe it’s possible to decondition fears over time, with practice and support when necessary. As I practiced driving in these situations, I reminded myself that my reactions were automatic, and I tried to detach myself from them, focusing instead on the motor movements I needed to perform to drive the car. The fear started to subside even more quickly than I thought it would. Within a couple of weeks, I was using the less-busy expressways in our city with ease, and with much, much weaker fear reactions. I began challenging myself by driving longer distances, on busier stretches of interstate, through traffic, and even straight over the Great Smoky Mountains (which was not expressway, but still something I would have never done just a year ago). Yes, there was anxiety, and there still is in certain situations, but I’ve come a long way in a short time, and taking the interstate feels normal to me again. I sometimes wonder why I was ever so scared. When it comes to eating disorders, I think this discussion may apply more to giving up restrictive dieting than it does to giving up the binge eating itself. You may want to lose weight or maintain a low weight, and therefore fear eating normal amounts of food or certain types of food. In order to avoid the anxiety and fear that eating (and thoughts of gaining weight from eating) causes, you may try to stick to a strict diet, which becomes habitual, and also leads to urges to binge that are impossible to resist because you are not eating enough food. If you’ve become so used to trying to restrict, it may feel scary to sit down to a normal-sized meal. Regardless of the reason you started dieting in the first place, dieting has become your habit and not dieting has become linked to the fear response. Because it feels scary, you may keep avoiding normal eating just to avoid those uncomfortable anxious thoughts and feelings. But, avoiding it over and over only perpetuates the problem and makes the harmful habits stronger. Once you realize that you need to eat enough food in order to quit the binge eating habit, and in order to have freedom and health in general, you’ll have motivation to change. But, just like with my driving, wanting to change doesn’t make the desire for the habit go away. You will need to eat normally despite the anxiety and fear response you experience around food. You have to know that you can still control your motor movements to pick up the food and put it in your mouth. This takes a lot of courage initially, probably more so than me merging onto the expressway the first several times; but it is well worth it. As you repeat the act of eating normally, the more normal it becomes until the desires to restrict fades, and normal eating becomes your new habit. It’s common for people to think that restrictive dieters or anorexics have an abundance of self-control because they avoid eating. But the error in this logic is this: what looks like self-control to an outsider is actually far from it. It takes much more self-control for an anorexic or restrictive dieter to eat normally in spite of her anxiety and fear than it does for her to keep restricting. Once the restrictive eating is a habit and there is a fear response linked to normal eating, then avoidance of eating for the dieter or anorexic is just like a binge eater following urges to binge, and just like me avoiding the expressway when I was afraid. An anorexic feels automatically driven to restrict in the same way a bulimic feels driven to binge – her restriction is not a sign of willpower. If you have fears about giving up binge eating itself, the same concepts I’m talking about here can apply. You can realize that it’s possible to experience fear of giving up the habit without allowing that fear to lead you in the wrong direction. As you continue not acting on binge urges, in spite of the fear, the less the fear will arise until being binge-free becomes your new normal. Then, you’ll wonder why you were ever scared of letting the behavior go. Deconditioning the link between your fear responses and your behaviors can take time and practice. Sometimes – even if you are doing well – situations can catch you off guard, and you may find yourself anxious about giving up dieting or binge eating. But if you can remember that you maintain control of your motor movements, and focus on that, it can help you keep performing the actions that move you toward recovery, regardless of what messages you might be receiving from your brain. There was a time while I was re-learning to drive on the expressway when my fear caught me by surprise. Because of a wrong turn, I ended up having to go over a very tall interstate bridge that I had not planned on taking. As soon as I realized where the road was leading me and there was no way out, I started to panic; I was shaking and felt terrified. But, I also knew I had to keep control of my motor movements, as I had 3 young kids in the backseat depending on me. I was caught off guard in a situation I’d never had to handle before during this process, and it wasn’t easy; but because I focused on what I could control, instead of the fear, it became doable. This is how athletes are able to compete in pressure situations– by focusing on the exact motions they need to perform, instead of their anxiety. People have conquered much bigger fears than driving on the interstate and learning to eat normally, and it’s important to remember that everyone experiences fear. I’m not saying you have to go face all of your fears right now, but I do want to encourage you by telling you that it’s okay to be scared, but it doesn’t need to get in the way of recovery. I understand that it’s easy to become complacent in avoiding the things that cause anxiety, and that the thought of facing a fear may initially feel intimidating; but it’s well worth it to change harmful habits or challenge yourself to accomplish new things.